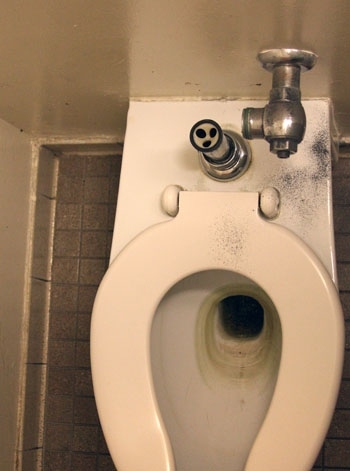 All right, here’s the straight poop: The UC Berkeley campus has got a crappy problem on its hands–or, rather, in its restrooms. Thieves have been sneaking into campus buildings and stealing the flushometers from the toilets, rendering them unusable and costing the university around $8,000 so far, a sum that, for this campus, is nothing to poo-poo. What’s worse is they’re not dealing with just any ol’ common crooks, here. These Johns are apparently toilet-crippling criminal masterminds. “But, why?” you ask, “Why would anyone sh*t all over others’ rights to sanitation, especially when the university is piss-poor?” The answer, friends, is greed. Turns out, one can make a pretty penny selling crapper parts as scrap metal and … used crapper parts. Gross.